Greetings again. Hard to believe that another week has already gone by. The time here really is flying by. For you praying types, please pray that his liver enzymes would go back down. Pray also for wisdom for the docs and clarity and unity in communicating what they feel is best for Josh. And pray for us, against any fear or anxiety that would try to creep in and for wisdom to make good decisions. Josh continues to enjoy his time here. He didn’t feel so great this weekend, possibly due to the liver thing. He wasn’t really sick or anything, just a little upset stomach and headache and he didn’t have a lot of energy. But he was better on Sunday and seemed like his old self on Monday. The only exception to that I guess is that his appetite seems to have decreased. Not sure what that’s about. Could have something to do with his ongoing lack of activity (compared to the norm) and I suppose it could have something to do with the other stuff going on in his body. While most of his time gets spent on other things (Wii, Skype, computer…), he does find time now and then to play the keyboard that NIH has let him keep in his room. You can check out a 30-second concert below if you like. I enjoyed my trip back to Wisconsin. I didn’t see as many people as I would have liked to, but I saw some and enjoyed walking all 72-holes of the Big Ten Women’s Golf Championships with my very talented golfing niece. She didn’t have her “A” game, but she played better each round and finished with a 76 in some reallly lousy conditions (windy, rainy w/ temps in the low 50’s). She finished tied for 32nd (out of 66) and the Badgers finished 4th as a team. The other thing I was most looking forward too on my trip home was 4 nights in a dark, quiet room in a king size bed. Unfortunately, and quite inexplicably, it did not make much of a difference as I continue to struggle to get quality sleep at night. I just can’t sleep for more than 1 1/2 or 2 hours at a time and often only get a couple of those in each night. I’m going to check in with my doctor tomorrow on this and see what he thinks. Julie is still doing very well and loving life pregnant. She’ll be back in Wisconsin on Thursday for anyone who wants to try to catch up with her. At the moment, that’s not very hard. Guess that’s plenty for this update. Thanks again to all of our family and friends for your prayers and support. In our last update we mentioned a somewhat significant drop in Josh’s neutrophils. They had dropped from 960 to 680 and at 500, we would have had to begin to add some additional precautions. We did another blood draw on Friday (the 680 result was from Monday) and his neutrophil count jumped over 1,400! While all our readers may not share this sentiment… that’s the power of prayer! As always, thanks so much to all of you who are praying. Keep up the good work! Joshua continues to sail through this season with very little difficulty. His adaptation to the isolation/situation truly makes this very easy for all of us. He is so easily entertained and there are no shortage of diversions for him. The latest one was Joshua’s first Skype video call – a 100 minute marathon with his buddy Kole. It was fun to watch them reconnect through technology that we couldn’t have even imagine when we were kids. Julie continues to be amazed at how quickly the time is going here. In addition to all the time she gets to spend with Joshua, she’s able to spend time with God every morning in ways that life typically doesn’t allow at home. She has said more than once that in many ways this seems like a retreat to her. Again, I attribute a lot of that to the faithful prayers of her family and friends. As I mentioned last post, she’ll be back in Madison for 4 days starting Thursday April 29th to have some routine OB appointments for boy #2. Nothing much to report from me. I’m still not sleeping very well, but there’s always time for a catch up nap so no big worries there. I’d just rather sleep better and skip the naps. Julie and I had the tremendous misfortune of choosing last Saturday to go see the Brewers play the Nationals. They were shut out on 4 hits and then on SUNDAY, they put up TEN runs in the top of the FIRST INNING! So you just might argue that we picked the wrong game. I’ll be coming home this Thursday for the weekend to watch my niece play in the Big 10 Golf Championship out at University Ridge. That only comes around once every 11 years I think, so we’re very blessed to have it happen while she’s in school. As some of you might know, she broke some UW school records on that course as a freshman, so we’re all very excited to see how she does this weekend. If someone could do something about the current lousy weather forecast for this weekend, I’d greatly appreciate it. I’ll leave you with a video you may have already seen from my Facebook post. It’s Josh and I playing hoops in the room and Josh making a pretty impressive shot. Wow! I can’t believe it’s been 5 days since we last posted. Time sure is flying by. Joshua had another blood draw this AM. They’re normally on Tuesdays but it’s subject to the right people being available in the lab. So last week Wednesday, this week Monday. This morning’s early lab results showed a significant drop in neutrophils. A drop was expected, but it’s dropped close to the point that they may have to give him some new antibiotics as a precaution and we may need to raise levels of precaution in the room (masks, gowns, etc.). Josh is fine. Just pray that his levels wouldn’t drop any further and that test results that are still to come would be positive. Josh continues to adapt well to the isolation which makes things easier for Julie and I. He’s pretty easily entertained and as I’ve said before, the support system here is great. 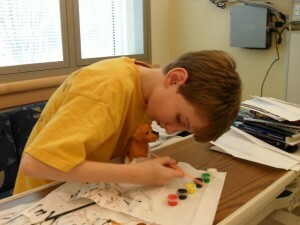 Above Josh is working on a painting project that the play therapist brought in for him. As you might guess, after getting this dog he asked if they had cats and of course they found one for him which he has yet to paint. Julie and I went in to downtown Bethesda yesterday to attend the “Church in Bethesda”. It was nice and reminded us some of our church at home. I was invited to come back Wednesday for their music/worship practice. Not sure how plugged in we’ll get at this point though since we don’t expect to be here too long this time around. Julie’s cousin Jim is coming to DC on business so they’re getting together for dinner tomorrow night. It will be good for her to be able to connect with family. Then later this month, Julie will fly back to Madison for some OB appointments. If you want to see her while she’s back, she’s flying home Thursday April 29th and then back out here the following Monday. Thanks to the generosity of some church friends, Julie and I are going to see the Brewers play the Washington Nationals on Saturday. Hopefully the weather will be good and the Brewer’s starting pitcher won’t stink up the joint. If I’ve got the rotation right, I think Randy Wolf will be pitching and he’s the only one who’s pitched well so far. Guess we’ll see. If the weather’s good, it should be fun regardless. Sunny and 72 today. Rainy and 61 tomorrow. Guess I better get out there! Day 16 of Joshua’s isolation seemed like an appropriate day for an update. If you don’t know why or just want to hear my “16″ story for the 16th time, just let me know. Joshua had another blood draw today. All the results from the first draw last week aren’t in yet, but those that have come in have been good. Some results come in a day or two but others take up to 10. 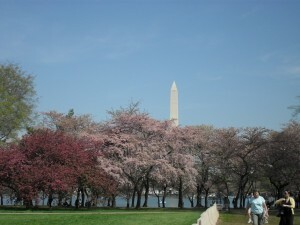 Julie & I both made separate trips this week down to the “Tidal Basin” (National Mall) area to see the Cherry Blossoms. It was a little “past peak” color wise, but still well worth the trip and a nice, WARM excursion away from computers, hospital rooms, etc. It was 80+ both days and today it’s supposed to by 88! Crazy. - Pray that Josh (and all of us) would continue to stay healthy and cope well with all the issues of displacement, isolation, etc. - Pray that I would sleep better in Josh’s room. It’s been pretty tough so far and I’ve had to take naps most days to try to catch up. Not much new to report here. Our first blood test results were pretty inconclusive as expected, but at least there were no significant drops in counts. A “no news is good news” sort of situation I guess. We’ll be attending an easter service at the chapel here in the clinic tomorrow, Julie & I that is. We’ll miss our church family. Julie is heading out on the Metro this AM to get a close up look at the Cherry Blossoms. This is the peak “bloom” period for the National Cherry Blossom Festival. There are a number of trees here on the NIH campus, but I guess the place to be is around the “Tidal Basin” where there are thousands of trees. The Brewers are in town April 16-18. We’re hoping to find some tix through someone at NIH but may break down and by them to catch a game. Like most DC stuff, it’s right off the Metro. Like Wisconsin, we’ve had some great weather here lately. We’re in a stretch of 70’s and are supposed to have 3 days in the 80’s next week. We’re about a month ahead of Wisconsin’s climate out here. Joshua continues to do fine in isolation. There’s plenty enough to keep him entertained, including a “play therapist” who comes in for an hour a day to do crafts, projects, games… with him. He seems to really enjoy the nerf basketball hoop we set up in the room, probably because it involves moving around. Sponge Bob and Patrick visit often of course, along with Annakin, Obi Wan and the rest of the crew. I started a 1-month trial with Netflix for their online movies and there’s a good selection in the NIH clinic library, so plenty of movies too. He’s had a break from school like he would have at home. His teacher will start coming in daily again on Tuesday. Julie and baby are well. She’s enjoying here time here more than she thought she would I think. More time available to her than she’s had in a long time and she’s making good use of it. Lot’s of rest, reading, walking, listening to Joyce Meyer and others and hanging out with me and the boy. Wishing we could be with family and friends for Easter, but we’re where we need to be right now so “that’s the way it is”.